Samsung is now taking to the streets to mock Apple – this time it’s George Street in Sydney, Australia. 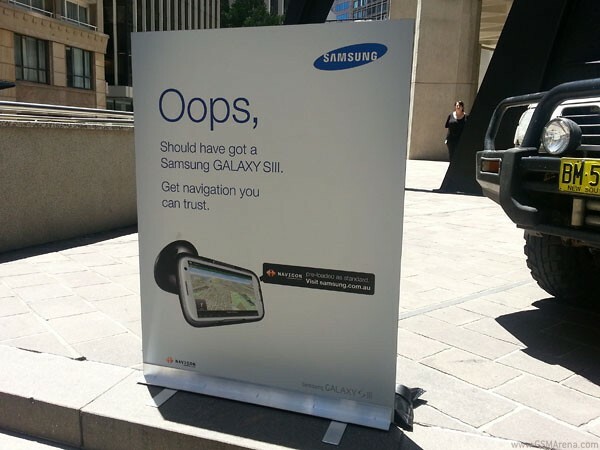 Samsung has put up a poster and a huge 4-by-4 with some camping equipment with a sign reading “Get navigation you can trust”. It’s obvious that the receiving end of the joke is Apple’s Maps app. What’s curious is that Samsung isn’t promoting its Google Maps app but Navigon, which comes preinstalled and with a free two-year license on the Australian Galaxy S III LTE units.